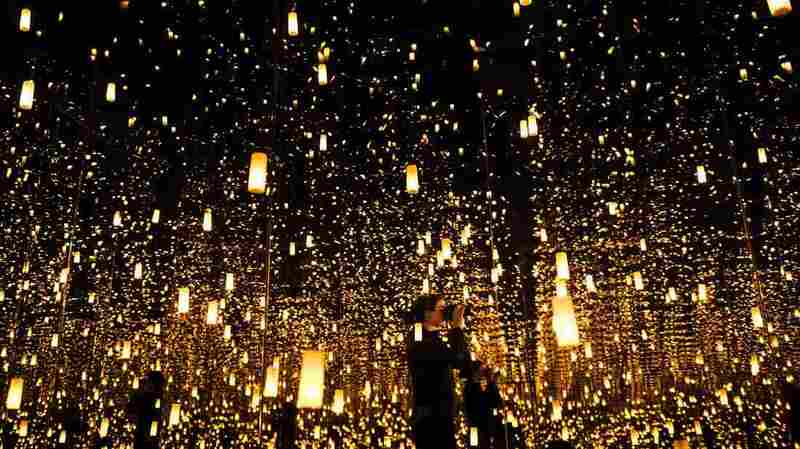 'I Came, I Saw, I Selfied': How Instagram Transformed The Way We Experience Art Immersive exhibits, such as "Infinity Mirrors" and Artechouse, are driving people to museums in search of the perfect snapshot. The craze is changing the way we experience art in the Instagram-era. A woman photographs inside the "Aftermath of Obliteration of Eternity" room during a preview of the Yayoi Kusama's "Infinity Mirrors" exhibit at the Hirshhorn Museum on Feb. 21, 2017 in Washington, D.C.
You are suspended in an endless dark chamber as thousands of red, green, yellow and blue lights flicker across the air like tiny diamonds in the sky. Or at least that's how it appears in the selfie you just posted on Instagram. Yayoi Kusama's "Infinity Mirrors" – mirror-lined rooms that seem to go on forever – is part of the latest art craze to take over social media. Immersive exhibits are driving people to museums in search of the perfect snapshot. Arielle Pardes, senior associate editor of technology and culture at Wired, tells Here & Now's Jeremy Hobson that the explosion of "made-for-Instagram" art exhibits is creating a market for art that is intended to be reinterpreted by people online. "You can sort of skip that whole first part where you have an artistic process and an artistic critique of something, and just go straight to the selfie by building a space that exists primarily for replication online," she says. In a TED Talk last year on "Art in the Age of Instagram," JiaJia Fei, director of digital at the Jewish Museum of New York, highlights the ascendance of "Instagrammable" exhibitions since the social media platform launched in 2010. "You think of Yayoi Kusama and her Infinity Mirrored Room ... and then artists like James Turrell or the Rain Room at MoMA," she said in the TED Talk. "These are artists who really have very critical bodies of work, but [created installations] that have taken on new meaning because of social media." Many of the masterminds behind these exhibits admit that creating social-media-worthy art was a key goal. In San Francisco, the 12,000-square-foot Color Factory features a pit filled with 207,000 plastic yellow balls, a giant Lite-Brite game and a life-size coloring book. "Our goal was that every exhibit be three things," founder Jordan Ferney told the San Francisco Chronicle. "It would be conceptual; very photogenic and do well on social media; and be an experience that you couldn't get anywhere else." Across the country in Washington, D.C., the interactive "sensory art experiences" at Artechouse seem tailor-made for Instagram. But the art and technology museum's founders deny social media played a role in their process, despite the fact the museum has been tagged in more than 25,000 Instagram posts since it opened in June. "There are people who would like to come tell a story," Artechouse co-founder Tati Pastukhova told The Washington Post in November, somewhat acknowledging Instagram as a main driver for the museum's more than 65,000 visitors. The deeply engaging quality of this art lends itself to social media because it allows the viewer to have a stake in the artistic process, Pardes says. "Part of it has to do with the fact that these exhibits are very very immersive, so you can go to it," she says. "And rather than just sort of staring at a piece of art on the wall, you actually become a part of the art." While the hunt for the perfect Instagram photo is driving a lot of people into art museums, Pardes says some museum curators argue that can distract from thinking critically about art. "If you're expecting that you go into this space and you get a great photo ... and you get to show people that you were there, then maybe that's not exactly what the artist had intended," she says. Pardes also argues the art in these exhibits takes on a different meaning when it is blurred by commercial interests. Before the New York location of the Museum of Ice Cream closed for the season earlier this year, 30 sponsors paid to have their brands featured. "Tinderland," a section of the exhibit sponsored by the dating app Tinder, prompted people to discover their "true flavor match." This potential divide among artists and consumers illustrates how social media has influenced our behavior. Pardes says even restaurants and retail spaces are redesigning their spaces to make them more appealing for social media. "In the pre-digital photography era, the message was: This is what I'm seeing. I have seen," Fei said in her TED Talk. "Today, the message was: I was there. I came, I saw, and I selfied."